Sup on the roof. When farm director Dave Snyder wants to check his crops, at Uncommon Ground in Chicago, he climbs a flight of stairs. The 2,000 square-foot roof has been transformed into the nation’s first USDA-certified organic rooftop garden. He’s part of a movement towards hyper-local food: minimizing your carbon footprint while maximizing your freshness, not just buying from nearby farms, but farming directly over your head. Uncommon Ground built a flat deck over its roof supported by steel beams and sturdy enough to hold 16 planter boxes and four tons of dirt. The growing season runs from May to October, and Snyder puts up portable windblocks to keep Windy City gusts at bay. In New York City, chef John Mooney of Bell, Book and Candle has ditched the dirt. 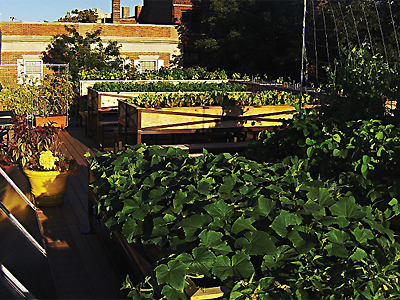 On top of a Greenwich Village apartment building, he’s erected a hydroponic garden. The system consists of 60 towers, each holding up to 32 plants. Each tower is automatically pumped water and nutrients for 12 minutes an hour. He grows 70 varieties, heavy on heritage and heirloom vegetables like purple tomatillos, and watches them ripen in two-thirds the time of a normal garden. To save energy, a manual hoist lowers his harvest six floors to a basement kitchen. The system cost $40,000 to install, but saves $6,000 a month on vegetable bills, says Mooney. Beyond recycling. In February, 2009, after Atlanta lost a convention because the client saw Orlando as a greener city, former caterer Holly Elmore organized a downtown zero-waste zone. With support from the Georgia Restaurant Association, operations like the Georgia World Congress Center and the Georgia Dome began to recycle not just paper, glass and plastic but spent fryer grease. Leftover food went to food banks, scraps were collected for compost. Lighting takes the LED. After a century of service, the energy-hogging incandescent light bulb is headed for retirement. Federal law will phase out most by 2014. To date, the main replacement has been the compact fluorescent, which uses one-fifth the electricity. But CFLs are less than ideal. Their light is harsh, and most can’t run on dimmer switches. Most restaurants don’t have the money or the space to put up solar panels or a windmill, but these days, they don’t have to. The U.S. Department of Energy lists 90 companies that sell renewable electricity. In areas where you can’t buy directly from a green provider, there’s another option: renewable energy certificates. Each certificate represents one megawatt-hour of output from a green power plant, certified by an independent organization. In Florida, Fort Lauderdale-based Pizza Fusion has teamed with Next Era Energy Resources, which runs 9,000 wind turbines. Next Era audits the restaurants’ energy use, counting not just electricity but gasoline burned by delivery cars and diners. The 22 restaurants buy enough certificates to make themselves carbon-neutral. Invasivores. Here’s a twist on sustainable seafood. Instead of avoiding an endangered species, eat an invasive one.One such species is the Asian carp, a voracious feeder that’s starving out native fish in Illinois rivers. Last July, Governor Pat Quinn agreed to export 30 million pounds to China, where they’re a delicacy. A handful of restaurants are doing their part. Chef Jimmy Wade of Heaven City Restaurant in Mukwonago, Wisconsin, is throwing Invasivore Tapas Dinners. Procuring fillets from a Chicago fishmonger, he serves them upscale, as Smoked Silver Carp Steak with Truffle Oil and Seaweed Slaw and Asian Carp Cakes with Cajun Remoulade. The trick with serving invasive species is to find a steady supply. At Sea to Table, a sustainable broker in Brooklyn, New York, owner Michael Dimin has introduced several chefs to the lionfish, a Pacific predator that’s threatening Caribbean coral reefs. He gets a couple of calls a day about the fish, which has a flavor and texture like snapper. The trouble is, it’s small and difficult to catch. “Spearfishing is the only way so far, and it’s hard to get enough,” says Dimin. He’s working with the National Oceanic and Atmospheric Administration to develop better fishing methods.